It’s more than a dental insurance, Plan for Health is a yearly membership program and an easy solution just for you! When it comes to finding a dentist that provides exceptional care and understanding in the Santa Cruz area, look no further than the dental office of Dr. Ippisch. Located near the Capitola Mall and within driving distance of Capitola, Live Oak and Soquel, Advanced Dentistry offers general and cosmetic dentistry services to clients of all ages. Your dental health is important to us. Regular dental care is vital to maintaining good oral health and our Santa Cruz dental office is ready to serve. Whether you need to have a cavity filled or discuss dental implants to replace missing teeth, Dr. Ippisch and his dedicated staff are here to help. If you have just moved to the wonderful Santa Cruz area or you’re live in the nearby suburbs, Advanced Dentistry can provide a full range of dental services to meet your needs and keep you smiling long after you visit our dental office. Our full-service Santa Cruz dental office offers veneers, dental implants, composite fillings, bridges, crowns, dentures, tooth whitening and more. There’s no time like the present to get the smile you’ve always dreamed of with Advanced Dentistry. We look forward to serving you and your family at our state-of-the-art dental clinic. 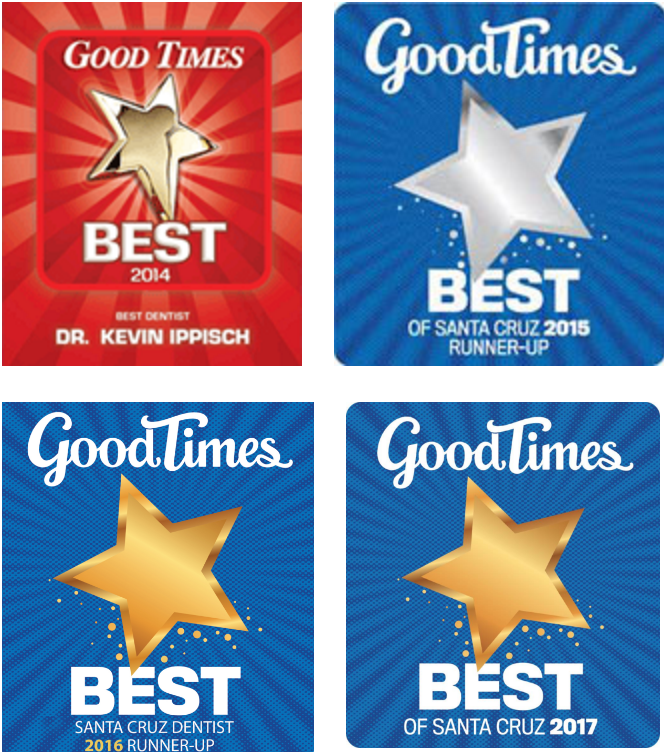 Dr. Kevin Ippisch has been providing family dental care in the Santa Cruz area for over 30 years and has been voted GOOD TIMES Santa Cruz “Best Dentist” in 2014, 2015, and 2017. We offer a preventive program, which is a cooperative effort by the patient, dentist and dental staff to preserve the natural dentition and supporting structures by preventing the onset, progress, and recurrence of dental diseases and conditions. We work with dental implants, composite fillings, porcelain veneers and lumineers, crowns and fixed bridges, and are able to improve your teeth and smiles with quick, painless and surprisingly affordable treatments. We offer many options for restoring a tooth back to its normal shape, appearance and function through root canal therapy, inlay and onlay restoration, and complete and partial dentures. We are skilled in periodontal diagnosis and offer state-of-the-art treatments of periodontal disease. Our registered dental hygienists can help you maintain the health of your gums and teeth through regular dental cleaning procedures and by educating you about a good oral hygiene and a balanced diet.